Impeccably furnished 3000 plus square foot vacation home. 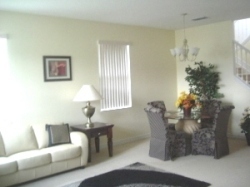 Located just minutes from the theme parks, Champions Gate and Reunion. Enjoy the area parks and golf in only a few moments drive. 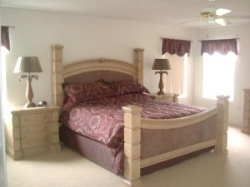 This home boasts 5 bedrooms including 2 mast suites both with King beds and televisions. The other bedrooms include a room with 2 twin beds, and each remaining from has a queen bed. 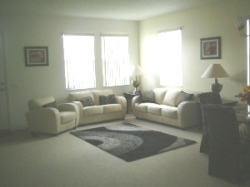 Enjoy either of the 2 family rooms. The downstairs family room is situated just off of the kitchen and features a flat screen TV that emerges from the cabinet, vcr/dvd combination and surround sound. 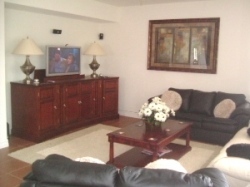 The upstairs family room has a large L shaped couch and television. If you prefer stretch out with a good book in the formal living room dining room combination located at the front of the home. This home's kitchen is well stocked with all of the essentials needed to prepare a meal. Designed for use you can enjoy your meals at either the island seating area or the oversized high top table. Soak up some Florida sunshine in the pool area. Whether you are playing in the pool, relaxing in the spa (pool and spa heating available for an additional fee) or simply working on your tan, the Sanridge pool and spa are the place to be. Come stay with us and RELAX! Balance to be paid - by or at arrival to arrival.